About a week before we left for our quick trip to New York, my husband was looking at maps of various neighborhoods in New York for eateries that caught his eye. We were still looking for a place to dine our last night in New York and couldn’t decide if we should just wing it and find a place when we got there, or if we should decide on a place in advance and make reservations. While he was looking around the neighborhood that we were planning on being in during the afternoon he found a place that caught his eye. He couldn’t resist looking further into this restaurant to see what it would offer and he discovered that the place was quite popular so he asked me if I would be ok with it and if we could make reservations. As soon as I saw the name of the restaurant, I knew exactly why my husband would be drawn to it. 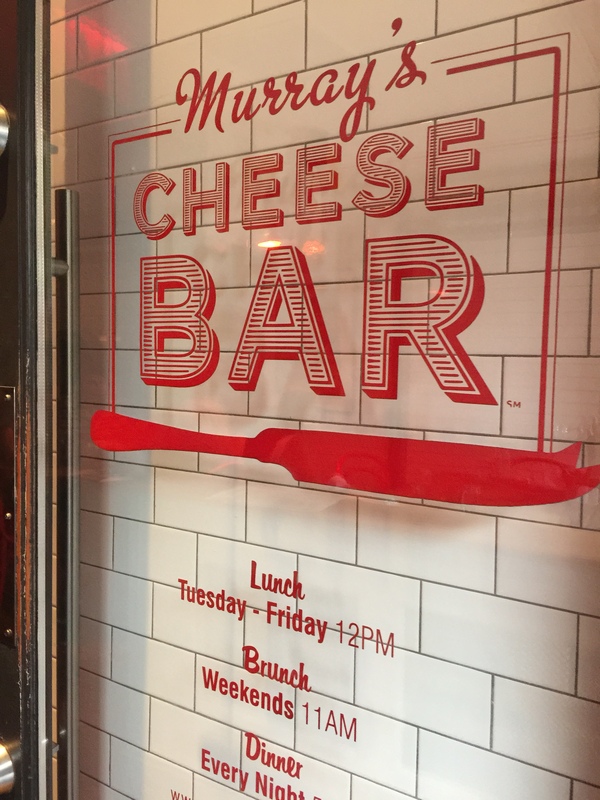 Murray’s Cheese Bar. Of course, any place with the word “cheese” in its title is going to pique my husband’s interesting. He just can’t help himself. 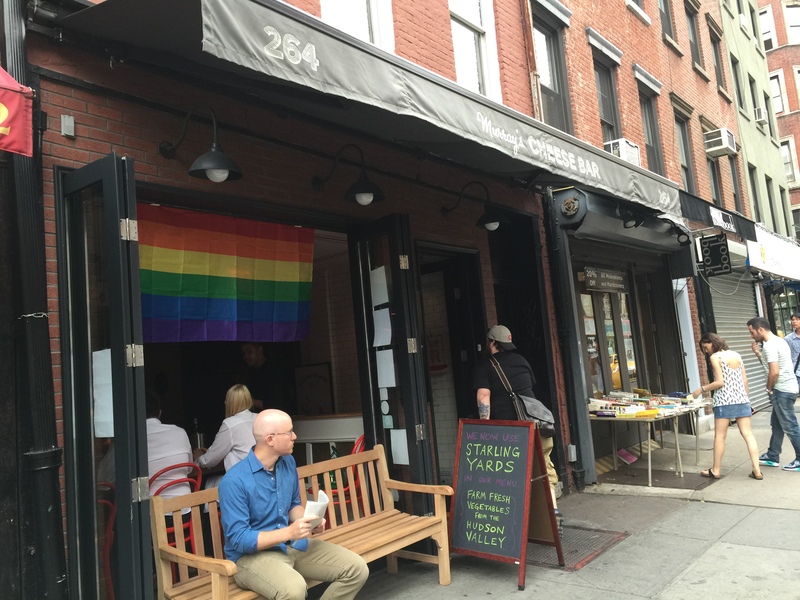 Located in New York’s very eclectic West Village neighborhood, Murray’s Cheese Bar is part of a long, rich history of cheese shops and is a perfect complement to their cheese shop just down the street. Started by Murray Greenberg in 1940 when he opened Murray’s Cheese Shop on this small stretch of Bleecker Street known for its many cheese shops, Murray’s expanded to a brunch, lunch and dinner restaurant in 2012 with the opening of Murray’s Cheese Bar under the guidance of owner Rob Kaufelt who took over Murray’s in the 1990s. 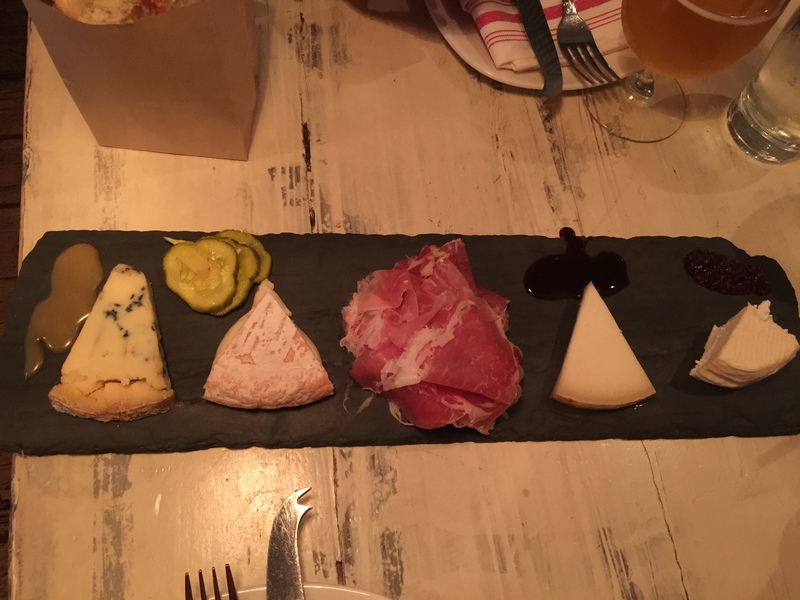 Today, you can walk to the cheese shop, which imports cheeses from all over the world and has even built their own cheese caves to age and ripen cheese over in Long Island City, and then walk down the street to the Cheese Bar where you can enjoy a variety of meats and cheeses and even local brewed beer and spirits. The night we walked into Murray’s Cheese Bar, it was a little cold and a little rainy outside, but warm, hearty and energetic inside. This small little restaurant has a handful of quaint small tables for 2 and four at the front of the restaurant and lined up against one wall of the restaurant leading to the back of the store. On the other wall of the restaurant is a cheese bar with a cheese display case and a bar which eventually leads back to the kitchen. 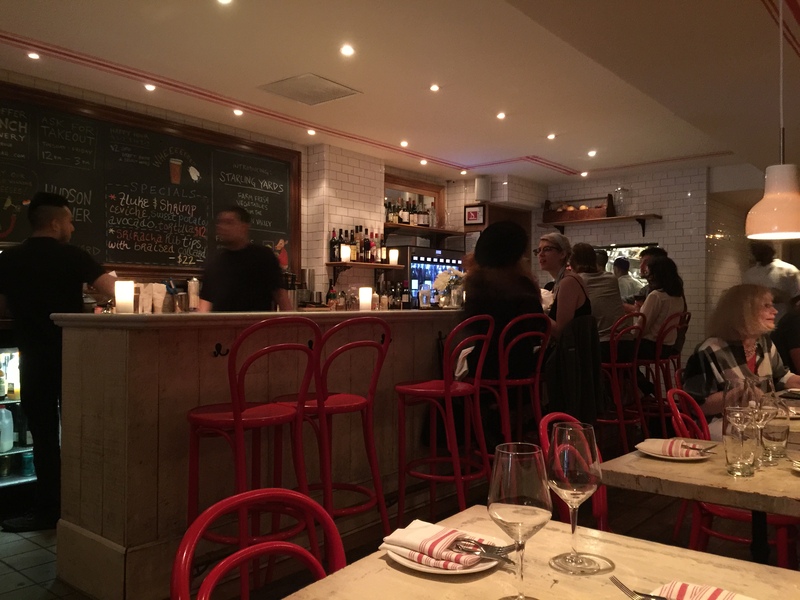 Much like the crazy, eclectic neighborhood surrounding Murray’s Cheese Bar, the restaurant is a mixture of laid back and upscale at the same time, full of energy and life. After a full day of sightseeing and walking around the city, my husband and I were both ready for a drink to sit back and relax with. For me, I chose a housemade ginger ale. My husband chose a beer called Merry Monk’s ale. 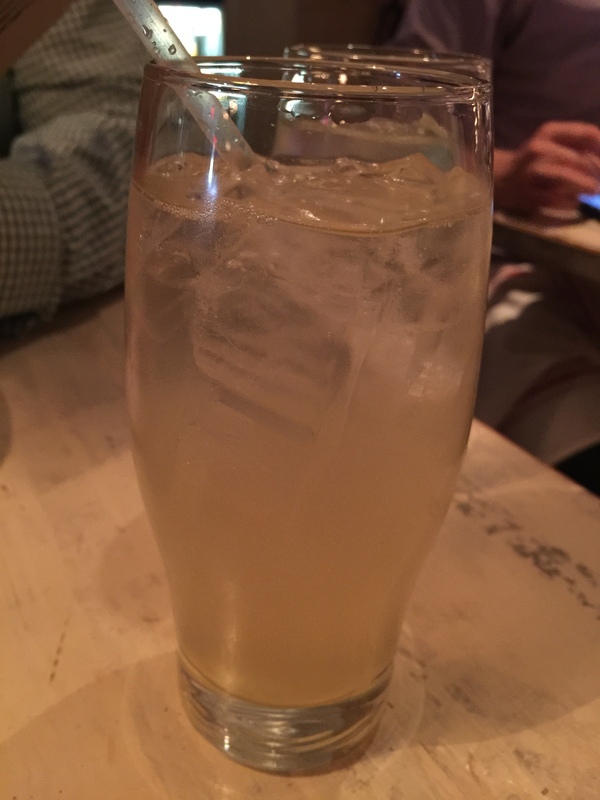 For me, the ginger ale was certainly refreshing because it had a nice bite of ginger flavor to it. More ginger than ale, it was strong and cleared out the senses, the way horseradish would. Luckily, I’m a fan of ginger, so I could handle it, but it was probably stronger than most people would expect or be used to. 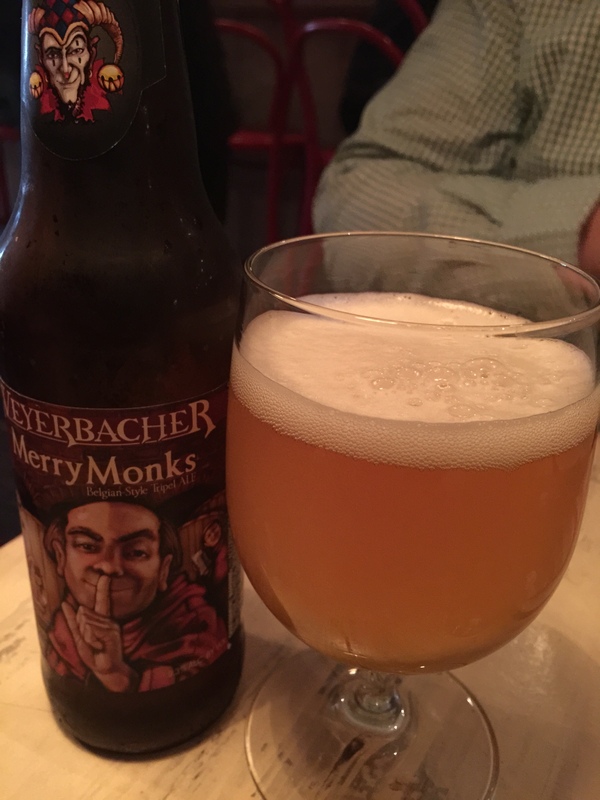 For my husband, he thought that the Merry Monk’s ale was interesting. He expected it to be more like Flemish-style beer, but it really wasn’t. He thought that the beer didn’t really have any bite to it, which he thought was interesting because it had a higher alcohol content to it than most regular common beers out on the market. Without seemingly any bite to it, my husband said it made the beer really easy to drink. This was the type of beer you could easily get hammered off of because it went down so easy and you wouldn’t even realize that it had more alcohol in it before it was too late. To start our meal, my husband and I ordered the Cheesemonger’s choice of five cheeses and meats. The menu we were provided with actually lists the restaurant’s full selection of cured meats and variety of cheeses so if you were inclined and you knew what you liked and didn’t like, you could certainly select your own. We figured the Cheesemonger would know what paired well together and what didn’t, so we had her select for us. With the choice of five you can mix and match the number of cheese and meat items. Realistically, the only meat item we wanted was the prosciutto di parma, so that’s what we told the waiter and then the Cheesemonger paired 4 complimentary cheeses for us. When you ask for the Cheesemonger’s selection the wait staff will ask if there is anything in particular you are interested in, you like or don’t like, that way the Cheesemonger gets a feel for what to serve you. The prosciutto was imported prosciutto di parma from Italy. The classic cured meat to pair with cheese, it was tender, and sweet and melt in your mouth. 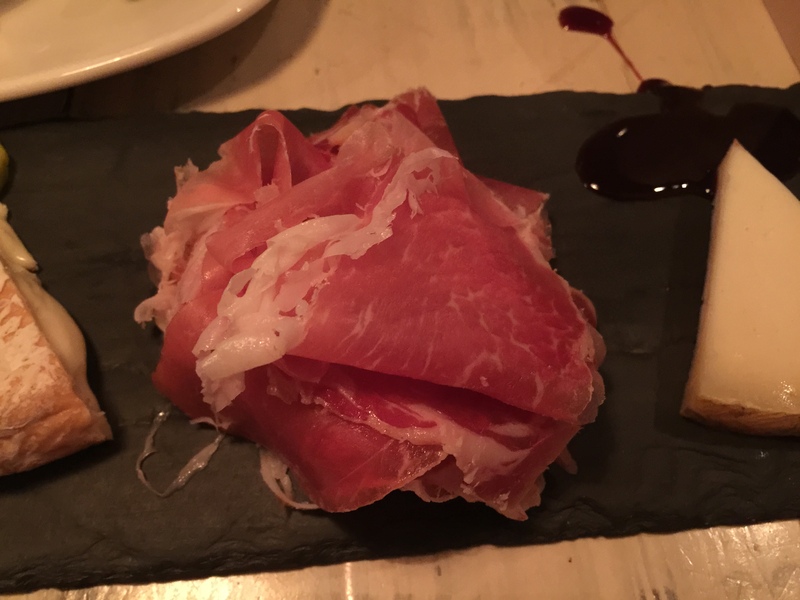 Slightly salty, the flavor and taste of the prosciutto was wonderful and exactly what I was looking for when I requested one meat to go with our 4 cheeses. Two of the cheeses that were chosen for us by the Cheesemonger were the Colton Bassett Stilton from England. A very strong cow’s milk blue cheese, I found the Stilton to be incredibly strong in flavor, almost too strong. On its own with bread we were given, I couldn’t handle the strength of this blue cheese. However, on the cheeseboard, the Stilton was paired with some caramel sauce, and when you put the incredibly strong blue cheese together with the rich and creamy caramel sauce, it really made the perfect pairing. The sweetness of the caramel balanced out the strength of the Stilton and together created a great dessert cheese that I ultimately went from not enjoying at all to really liking the best of the four cheeses on the plate. The next cheese was the Nettle Meadow Kunick. This was a local cheese from New York made from a combination of cow’s milk and goat’s milk. The cheese was described to us as being soft, creamy and buttery. This is the type of cheese that is just up my husband’s alley, a little soft and melty in the middle with a rind/crust on the outside. However, we were warned that the cheese itself smelled a little “funky.” Alright, that’s completely up my husband’s alley because “funky” cheese is not something I enjoy. My husband admitted that yes, the cheese did smell funky, but the texture was buttery and taste was good, so in the end, that’s all that mattered to him. 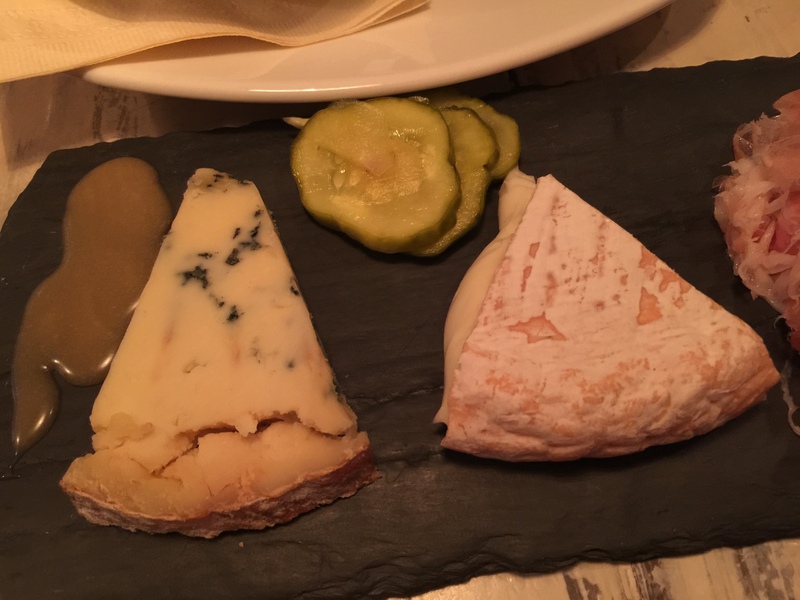 Paired with this New York cheese was housemade pickles, but as neither my husband nor I are pickle fans, we didn’t have any of them. 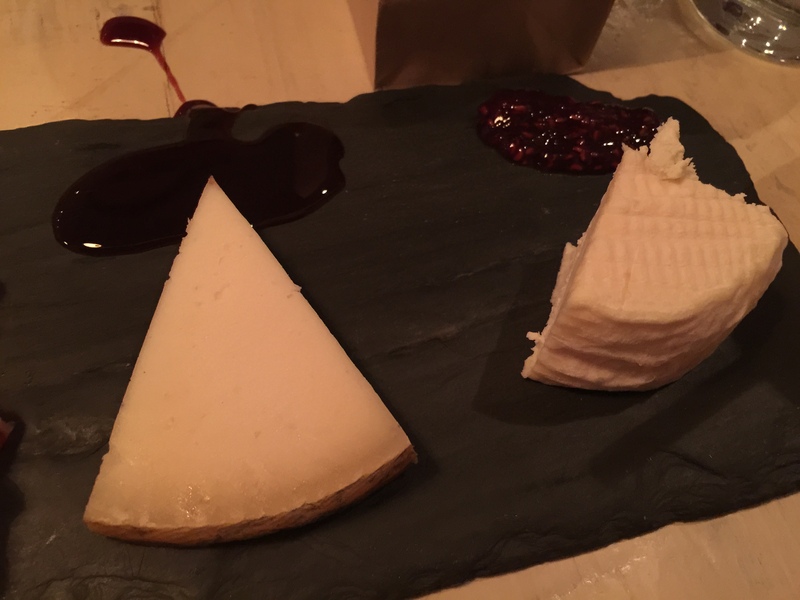 The other two cheeses that were picked for us included the Montealva, a goat’s milk cheese from Spain. I was really surprised because I really liked this cheese. I’m not normally a fan of goat cheese, but this one was actually more like a strong, aged cheddar, which I love, than the classic soft goat cheese I think of. This hard cheese, had a very strong flavor, that was described to us as being lemony and bright. This was paired with a reduced raspberry balsamic sauce which was tangy enough to stand up to the lemony flavor of the cheese. Of the four cheeses we received, this was my second favorite behind the Stilton. Our final cheese was the Vermont Creamery Torus from Vermont Creamery and made especially for Murray’s. Again, this was a goat’s milk cheese, but definitely a softer cheese than the Spanish cheese. Vermont Creamery created this Torus especially to be aged in Murray’s underground cheese caves to age. Using recommendations on what Murray’s wanted, a cheese was created and encased in Vermont Creamery’s signature rind. After some further suggestions from another cheesemaster, a “hole” was cut in the middle to create a “donut” so that there would be even more surface area on the round to add this signature rind. Hence, the nickname of this cheese is the Cavemaster Donut. What you end up with is a cheese that my husband and I found to be soft on the inside with a soft rind on the outside. It was delicious, and definitely something my husband enjoyed more than I did as, again, I’m not a fan of soft cheeses. While we enjoyed all four of the cheeses we received, I think we both agreed that this Torus cheese was our least favorite because it just didn’t strike enough notes to be different and bold the way the other three cheeses were. Another item my husband saw on the menu that he couldn’t pass up was Buffalo cheese curds. You wouldn’t believe how much of a fan of cheese curds my husband is. Again, must be a Midwestern thing? He can’t resist when he sees cheese curds on the menu anywhere, especially since they are so hard to find. Therefore, he had to get an order of the Buffalo cheese curds with Black River blue cheese dressing and a side of celery sticks. While I enjoy cheese curds, Buffalo sauce is not something I enjoy, so I left him to enjoy this appetizer all on his own. 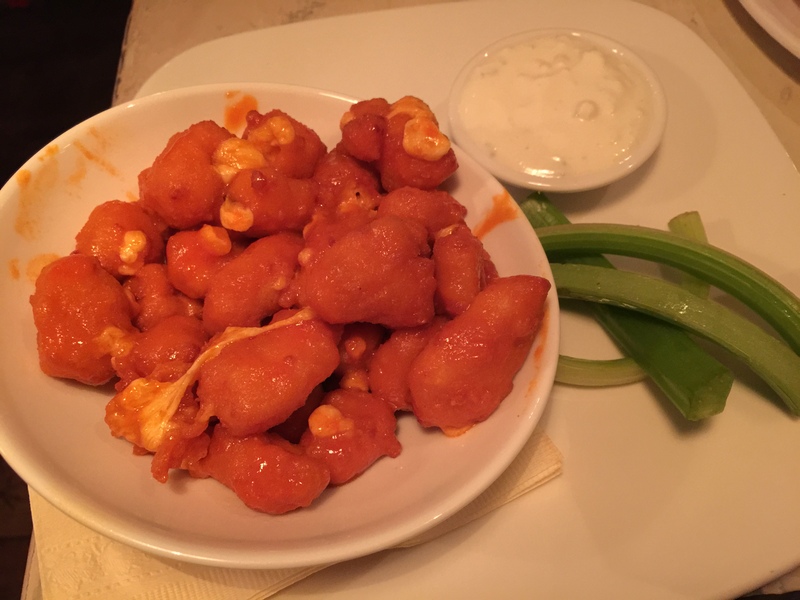 My husband liked the spicy flavor of these Buffalo cheese curds, but did say that he wished that there was a little less of the hot sauce and more of the cheese flavor itself. He was really hoping to taste the flavor of the cheese and not just the sauce, but got more sauce than he wanted and not enough cheese. For my entrée, I went with something light since we had such a heavy lunch. Poached pear salad served with manouri, spring greens and candied walnuts. I know, a cheese restaurant and I probably order the least cheesy thing on the menu. I just wasn’t that hungry and the idea of something cheesy and heavy, just wasn’t in the cards for me. 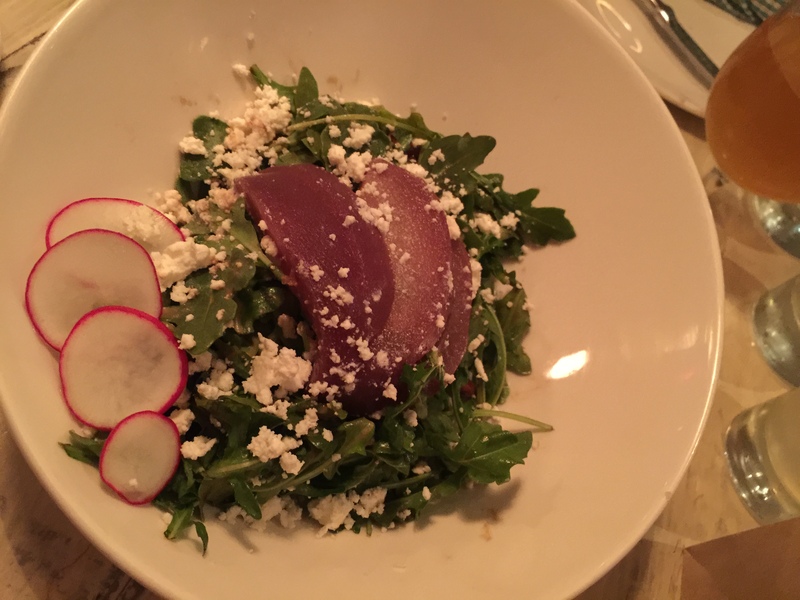 The cheese component of this salad comes in the manouri which I discovered later is a soft whey cheese made from either goat or sheep’s milk and is a by-product of the production of feta, which is why they are so similar in texture. I was originally concerned about the poached pears and what they would be poached in and how it would taste. I know that most of the time pears are poached in wine, but sometimes they aren’t poached long enough and all I taste is a pear that seems like it was just soaked in wine rather than poached. But these were perfect. They were obviously poached in red wine, but poached long enough to get the sweetness and flavor of the wine and the color, of course, but all of the alcohol has been burned off. The pears were soft, but still had a bit of crunch to them, which just added to the texture. The greens themselves were just light dressed in some sort of lemony vinaigrette, which was perfect with the manouri. And the candied walnuts were terrific, the perfect sweet finish and crunch to this light, bright salad. Dinner for my husband was the cheese bar sliders. A plate of 3 sliders with 3 Cheesemonger’s choice of cheeses was a great, simple way to sample more of Murray’s cheese selection. Served with cornichons and Murray’s own homemade ketchup, the sliders were literally a grilled bun, hamburger patty and cheese. Nothing else, and nothing was needed. The cheesemonger’s choice of 3 cheeses included a blue cheese, a mild cheese like a jack and some sort of a cheddar cheese. My husband, who is already a huge fan of jack cheese, especially its great melty consistency under heat, enjoyed the mild, jack-like cheese the best. The blue cheese was good as well, a little soft, but not overpowering in its blue flavor, so you could still taste the beef and the bun and know you were eating a slider. For my husband, the slider with the cheddar cheese just made the slider just like any other slider, nothing overly special about it. But again, cheddar is also probably my husband’s least favorite type of cheese. 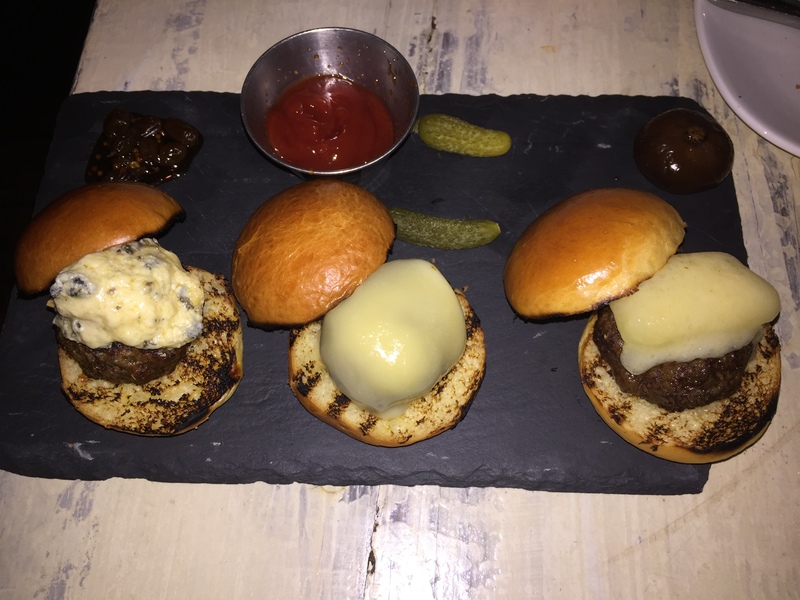 After all the other courses we had tried on this night, these 3 sliders was the perfect size for an entree. My husband, who originally chose Murray’s Cheese Bar, was really happy with this selection. Put cheese in front of him and he’s a happy camper. Make it a restaurant that specializes in cheese, and he’s in cheese heaven. The cheese plate we ordered with the Cheesemonger’s choice of cheese was really eye-opening for me to see how well different cheeses paired with other different flavors such as caramel sauce, fruit-flavored jams and other pastes. It’s amazing how different complimentary sauces can really transform the taste of certain cheeses. To me, that was the most eye-opening part of dining at Murray’s Cheese Bar. I admit that I did not enjoy Murray’s as much as my husband did, but that’s probably because I don’t enjoy cheese the way he does either. That’s not to say that I didn’t enjoy dinner and that I didn’t walk out of the restaurant full, because I did. I’m just saying it might not be my first choice for dinner, but it was a very interesting and different experience for me.